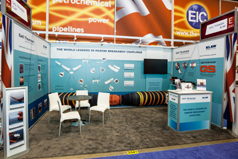 Shown above is the Gall Thomson Stand a moment before the opening of the 2014 Offshore Technology Conference in Houston USA; Gall Thomson shared the Stand with its sister companies KLAW and KLAW LNG. Guest of honour was MBC 0001 – the very first Petal Valve Marine Breakaway Coupling ordered from Gall Thomson back in 1980. 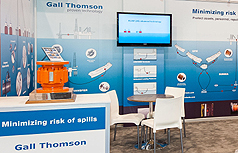 With lots to see and talk about, the Gall Thomson Stand was tremendously busy throughout OTC 2014. 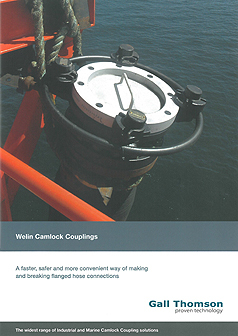 The benefits of the quick fitting Gall Thomson Welin Camlock Coupling are detailed in this new 8-page brochure. The Welin Camlock is much quicker and safer than the more time consuming and hazardous flange connection of drift pin, nut and bolt. Each cam on the Welin Camlock only takes approximately 5 seconds to lock and is impossible to loosen during normal operating conditions when there is pressure in the line. For further information or a copy of the brochure, please contact us on: +44 (0) 1493 857936. 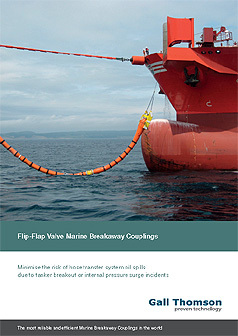 Gall Thomson has published an 8-page brochure introducing the benefits and specifications of its Flip-Flap Valve Marine Breakaway Coupling range. 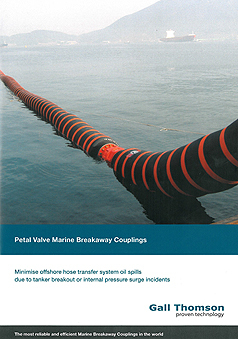 The brochure includes an application diagram and sequential illustrations demonstrating how the Gall Thomson Flip-Flap Valve delivers minimum headloss and 100% leak-free shut-off. 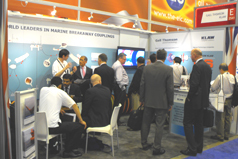 Gall Thomson had a vibrant four days at Offshore Technology Conference 2013. 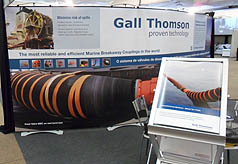 The Gall Thomson stand demonstrated the applications of its systems and why the proven technology of Gall Thomson is the global industry standard for efficient and safe marine transfer systems. 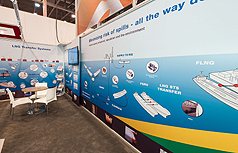 Gall Thomson shared the Stand with its sister company KLAW and the unique mix of efficiency and safety offshore transfer products provided an extremely productive contribution to OTC Houston 2013. Following on from the launch of the Brazilian Portuguese Petal Valve brochure, Gall Thomson has published an English language version that introduces the Petal Valve MBC range. As with the Brazilian version, this brochure contains 8 pages of detailed information and is great introduction to the Gall Thomson Petal valve range. The applications chart and options table is also included. The VIII Monobouys Operators Conference in Florianopolis, Brazil was held on 6th, 7th and 8th November 2012 and proved to be a great success for Gall Thomson. Delegates showed keen interest in the Gall Thomson Marine Breakway Coupling range and the event provided opportunities to meet and discuss technology and solutions for the Monobouys sector. Photo: The Gall Thomson Stand moments before the conference began. 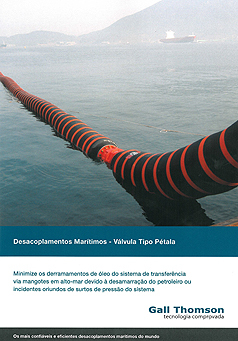 Gall Thomson has published a Brazilian language brochure that details the benefits and specifications for the Petal Valve Marine Breakaway Coupling range. The brochure contains 8 pages of information and is a good introduction to the Gall Thomson Petal valve range. A useful application chart is also included.